In the stillness of the early morning, I come to my desk and write. Darkness is brushed away by the gentle glow of my lamp. All slumber, save me, for it is the appointed hour, the time set aside in my hectic life to bring forth words upon the page. So I sit at my desk, and begin to relay a tale, of a king, anointed by God, asked for by His people, but against the will of the prophet, Samuel. Images of great battles and events of lordship and fealty take shape. Through the vivid drama played out before my mind’s eye, a solitary figure emerges. Just a glimpse at first, then a gentle nudge, until at last, he erupts upon the scene in full grandeur, filling the pages. He has a story to share, a tale to tell, and he has chosen me as his vessel. I listen to what he has to say, but I only allow him an opening place in my story, a lead into the main action of what I have chosen to recount. But he is relentless, pressing into my mind, usurping the process; until, at last, I stop and take notice. Before I begin my scheduled writing time, I have a moment of prayer. I ask of God direction in my work. Each word, each phrase, is to be the voice of God, revealed within my manuscript. It is, and has always been, my chief desire to express the message of the Lord upon the pages of my books. And I have been amazed at the words He has given me. So there I was, trying, with great effort, to write a novel about King Saul. The story came, but this nagging image of another character kept taking my attention. I added scenes to the beginning of my book in an attempt to quell the voice of this one leaning heavily against my mind. Then it came to me, as so often thoughts do, in the dark, as I lay in my bed. But that is not the story I want to write, I thought to myself, in the stillness. But the Lord is faithful, and we had a deal. And as it often is with God, He exceeded His promise. The novel grew to 315 pages; 90,843 words. THE STONE OF EBENEZER has been selected as a finalist in the Women of Faith 2012 Writing Contest. Winners will be announced March 31. 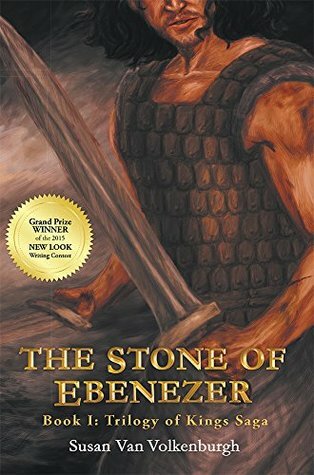 I am pleased and honored to accounce that THE STONE OF EBENEZER has been selected as a finalist in the Women of Faith 2012 Writing Contest. The top three winners will be announced on March 31, 2013. I cannot wait to share this story with you all.